A promotional image for Series 17 was revealed at the New York Toy Fair. What appears to be an elven woman (middle-back), the axe-and hammer-wielding dwarf sporting a red mohawk and beard, and the guy with the trident appear the be fit for Castle collectors and builders. 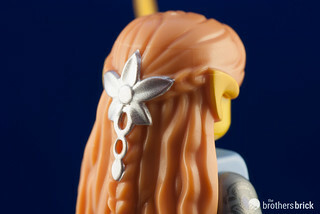 Personally, I am excited that we will be getting another elf-ear headpiece in yellow. An archer is only as reliable as the string on his bow. Oh yeah, that's real good. It looks like the strongman might have a peasant or barbarianish print to him, too, and whatever that guy in the tricorn is must be pretty spectacular if they're still keeping him secret. Looking close at the elf it looks like she's got a dress slope and one of those longer triangle shields, and I gotta say that Warhammerish dwarf might just be my favorite Collectible minifigure yet. The pulp spaceman and the rocket suit, though not Castle-like in the least, are also quite cool. And what king of dog do you suppose that's supposed to be? A pit bull or pug of some kind? Lots of great figures! Another elf and another fairy! Crazy looking dwarf! Retro space hero! The chef and strongman look pretty cool too. New eggbeater part. I'm guessing he's a French Bulldog, since he's accompanying a presumably French painter. Definitely some good ones in here. Can't wait to get my hands on them! 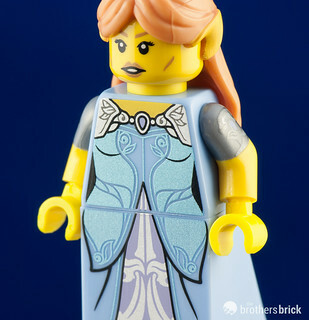 I'm looking forward to seeing more detailed pics of the elven woman. The Elf certainly looks promising! Though I'm pretty disappointed by the dwarf, it would have been nice to get one more along the Evil Dwarf lines, but on the 'good guys' side this time. Lots of great parts for the picking. I have been waiting for a red mohawk for a certain ginger in my stories for some time. The mystery figure has me puzzled. More official images and the official names have been released. I've cropped out the most directly castle-relevant fig pictures to see what details we can see. BTW, these are officially "Elf Girl", "Battle Dwarf" and "Roman Gladiator". BTW, I see no reason why the final fig is a mystery. From the silhouette it seems to be a pirate, American revolutionary, a highwayman, or some other fig from that general era. What's the big secret? Is this supposed to hint at some upcoming theme? Movie tie-in? Click the pic to see the rest. This series seems to be full of duds for me. I am really curious to see what the black silhouette guy will be. I would be extremely pleased if he does have a tricorn. Disappointed the gladiator doesn't have a net, shield, or helmet or something. I think a net would be historically accurate for him - Retiarius? I should have just waited a day, because the Brothers-Brick has a full review, with many close-up high quality photos of the figs from all sides and also their parts. For example, here are two of the views of the Elf Girl. Follow the link for all the pics. I do really want that bunny. I'm a little more interested after that review. Especially the little guy in the rocket suit! And even more curious at the "Mystery fig"
This was purchased at the Legoland Billund shop a few days ago, and therefore is fair game and not a leak. I have no darn clue why this was supposed to be a big secret. 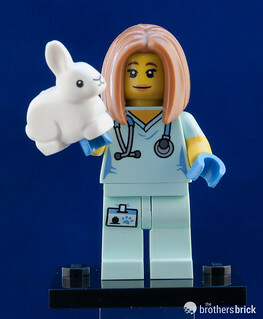 It's nice, but it's not even the coolest fig in the series. IMO (of course) that honor goes to the Elf Warrior.